R-Type was one of those series where it took me forever to play the original versions of the game. 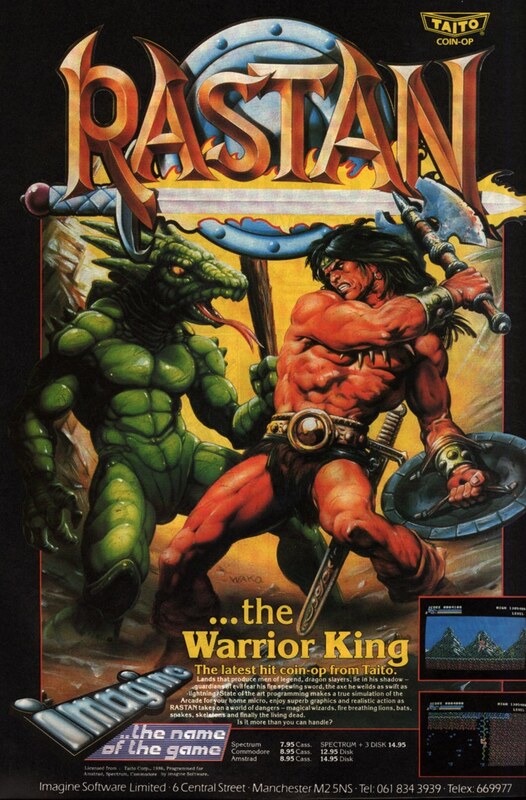 I knew the series was pretty awesome, having seen pictures of the Dobkeratops and other monsters, but had never actually played one of the games. Super R-Type was my first foray to the series, which is kind of sad in some ways as it’s not one of the better titles. In fact, Super R-Type is based off R-Type II, which was one of the hardest games in the series (and not one of the best…), here made even harder in that there are no halfway points! That’s right, you have to play the entire stage from beginning to end. As a result, I’ve only beaten the game once, and that seems to have been enough for me! However, the music still sticks in my head long after I’ve put the game back into the shoebox next to all the other SNES games I haven’t played in years. The most notable track is “Solo Sortie”, the opening stage, a new short level serving as prelude. The stage is fairly simple, an asteroid field with weak defenses, but the music is spectacular, with instruments ranging from a pounding background rock guitar, brilliant piano, strings and flute, a lead trumpet taken straight out of hip school, and the ever-present drums that tap away with horseshoe clatter and the chatter of weapons-fire. The track opens with five seconds of descending piano notes taken straight from the original R-Type before the strings burst through the clouds to a flurry of trumpets that are absolutely all over the place, flying across the scale with the surgical precision of an ace pilot, raiding first the highs, then mids and lows and back again, just as the R9 fighter swoops through the oncoming asteroids. This trumpet is punctuated by screeching bursts from strings and flute before swinging into a melody dominated by flute and strings, supported by trumpet and drums. This hits a finale with a blast from the guitar at 1:17 that loops back to the beginning before hopping back to low notes on guitar. It is here that the stage ends and the boss battle begins, but what is most interesting is the song contains additional material! It would normally have been impossible to hear this music in-game, but using SPC players, we can hear the entire song as the composers intended. This includes a trumpet solo beginning 1:52, followed by a beautiful piano solo at 2:20 with support from strings. In told there is about one minute of new material for a 2:50 loop that runs over a minute longer than the actual stage. The composers’ names are pretty anonymous, which is a shame considering how good the music is. However, some of these names crop up in other titles. Hiya, the pseudonym of Takushi Hiyamuta, also composed Gunforce and later left Irem to work on the Metal Slug series along with many other studio refugees. Update: The proper track has been uploaded. Sorry for the mix-up! The other one was the boss theme. I’m a pretty big fan of the R-Type Delta (1999) soundtrack. The game had the memorable melodies that the previous games in the series were notable for, but had a greater variety of music than what was found in R-Type III‘s hard rock. The mix of guitars, midi synth, strings, piano, and choir make it one of the strongest and most diverse in the series. One interesting thing to note is that the composers of R-Type Delta worked on Konami’s MIDI Power Pro series of albums, which explains why the album sounds a little similar. The tracks in Delta were also composed to play out over the course of an entire level and so do not loop during gameplay, making the tracks orchestrate the pacing and mood of the entire stage. The track opens with a haunting choir tinged with sadness and melancholy that is soon supported by somber strings. After, we are drawn into the dance by an ethnic drumbeat with tribal percussion, particularly from the thunder sticks (hollow tubes filled with beans or other small objects that rattle when shaken). Amidst it all, the lead female vocalist calls out in a high, fluttering voice that is pure but strained. Almost midway, the track takes a dramatic break with the tremulous singing of a male vocalist punctuated by the high chants of the female choir and the deep pounding of the drums. After this point, the track loops into some heavy percussion before repeating the first half of the song. I’ve complained about looping before, but in this piece it seems a bit less noticeable with its clear beginning, middle, and end. The piece was composed by Haruhiko Kuroiwa, who is credited with working on the Samurai Spirits series. 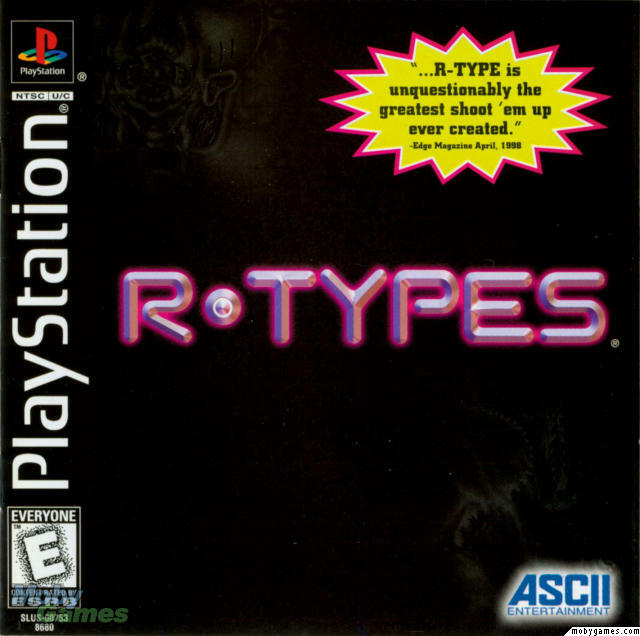 Here’s another favorite: R-Types for the PS1. Back in 1998, Irem was celebrating the launch of R-Type Delta with a re-release of R-Type and R-Type 2 for the PS1. The games featured a pretty straight-up port of the arcade originals, with the addition of level select as well as some prerendered cutscenes (with music composed by Tomohiko Sato). There was also a nice gallery that included a history of the R-Type universe, from the development of the first R-series spaceships to the invasion of the Bydo. Great stuff! R-Types also included some original music, one of which was this nice “Data Menu” theme. It’s got the trademark guitar sound of the series, a perfect combination of hip and Joe Cool. The melody even uses a scale similar to the famous “Stage 1” theme of the original. The track perfectly fits the hangar depicted in the background, a lazy beat like a tour through the relics of war, those famous fighter craft tuned up and serviced before being sent back to the line. A celebration of the machines of war, the heroics of the solitary crack pilot, as well as the glory of the games that feed on this legend. Tomohiko Sato is credited with composing the music for the CG sequences. He also worked on Ogre Battle, Mega Man 6, and MAG. USP (which I think is a group) is credited with the audio. I’m not sure which one did the menu theme. “Piano Smasher” is an interesting use of licensed music. 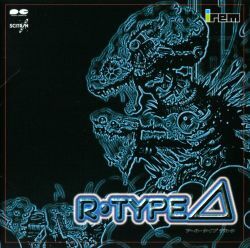 The track was originally composed by Blue Man Group for The Complex (2003), but was later used in R-Type Final for the credits to the US version of the game. 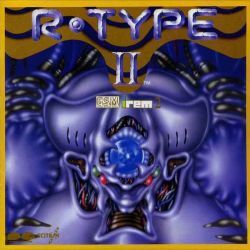 R-Type Final (2003) was not really the final game in the series (Irem is still making R-Type Tactics), but it does seem to be the final original shooting game. To make up for this, Irem let players try over 100 ships, though sadly, the game doesn’t seem to have quite the replay value to warrant playing them all (and indeed, requires hours and hours of play to unlock). I’ll also say this was part of a purchase that made me stop buying VGM without attempting to learn more about the music first – the album was fairly disappointing compared with the series’ usual guitar-driven fare, and “Piano Smasher” wasn’t on it (I later got The Complex). This version of “Piano Smasher” is from the IGN news post made eons ago. In the game, the player destroys the final Bydo core deep in their alternate dimension. However, his ship is destroyed in the explosion, and its ruined hull floats forever in the lost reaches of space. The final SOS transmission sent from the ship was picked up a couple stages earlier. It’s a pretty sobering end to the long-running series, and perhaps a little disappointing, but “Piano Smasher” fits the creepy feel of the Bydo, particularly with the infectious synth line, electric violin, and, of course, the Piano Smasher. The Piano Smasher is a special instrument that combines a piano with a sledgehammer for some unique percussion. By hitting key notes on the piano, the musician is able to create a core of five deep tones that rumble through . Similar to John Cage’s explorations with instrumentation, the Piano Smasher is a novel use of traditional instruments to produce amazing new sounds. It is used in plenty of Blue Man Group’s other music. Other sounds to listen for are what I believe is an electric violin and some phenomenal drumwork. There’s plenty of distortion to traditional instruments as well as new ones in Blue Man Group’s work. Anyway, it’s very different than the pop song “PROUD OF YOU“, sung by Shiina Hekiru, used in the Japanese credits. Read the rest of this entry ? I was always a fan of the R-Type series. I can’t really say where my love for it began, but it may have been from images of the Dobkeratops I had seen. The first version of the game I ever played was Super R-Type (1991), which is arguably the worst and most difficult game in the series. I was able to beat this after much hardship, but never managed to get anywhere on a difficulty higher than ‘easy’. These games are pretty brutal, but they have absolutely fantastic artistic design and – for most of the series – excellent music. This track is an arranged medley of several tracks from R-Type II (1990) and goes well with the whole CD’s recent release on Slightly Dark. That’s right: R-TYPE II -G.S.M. IREM 2- came out 20 years ago this week. “R-Type II (Arrange Version)” opens with a nice sense of outer space through atmospheric instruments, static bursts (or perhaps the moving of insect legs), and an SOS signal. Because it begins so quietly, be sure to turn your speakers up a little! Before transitioning into the medley, it then plays some notes from the space organ, which when coupled with the SOS signal sets the game’s dark atmosphere. The main body of the track is a medley of several tracks from the game, including “R-9TO The Front (Stage 1)” (1:20), “Water Splash (Stage 2)” (2:20), “Dead End” (3:55) and “Boss Theme” (4:25). Read the rest of this entry ? Following this week’s ‘theme’ of shmups, I’ve got a classic from 1993: R-Type III: The Third Lightning (1993). This track is “Outer Space” the famous Stage 1 theme from R-Type and R-Type III. This is some serious heavy rock from the Super Nintendo’s SPC700, so before you hit play crank the volume to 11. Nintendo didn’t say “Play it Loud” for nothing! I’ve also included “Into the Portal”, the track the plays before you begin the stage. The two kind of go together. “Outer Space” first appeared as the Stage 1 theme in R-Type in the arcades (1987). The R-Type III mix is a fantastic revisit to the original, with plenty of variation on the tune featuring that lead guitar. Ikuko Mimori’s remix of this track is simply marvelous and one of my favorite rock videogame tunes, and as much as I love the synthesized guitars here, it’s simply dying for a full-on live instrument recording. The entire soundtrack is heavy metal like this, with later stages adding some really dark minor-key choral sections and organs for some wonderful atmospheric flavor. According to Snesmusic.org, Mimori hasn’t composed anything else (which is a shame!). I think the original song was composed by Masato Ishizaki (according to R-Type – IREM Game Music). There is a pretty good mix of this track from R-Type Special, but I’m trying to track down a higher-quality rip than the 128-bit garbage I’ve got. The PCE-CD version of the R-Type has a fun techno mix. You can get R-Type III off the Wii Virtual Console. This track plays in the opening stage and so has very aggressive gung-ho music, just what you’d expect to hear accompanying a pilot fresh off the carrier. 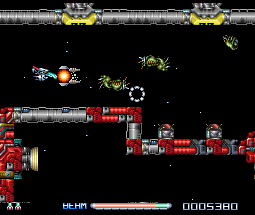 In R-Type III, this was a giant space station that had been taken over by the Bydo and so was filled with debris as well as baddies, including some giant mechs. This piece reflects the determination and lazer fire before the blackness of space. It really makes you feel like you can win – but then, you blow up.